I am pretty awesome at starting craft projects. I am not pretty awesome at finishing them. Sometimes I finish them. The odds of finishing a craft project are increased based on the simplicity of the project or the time it takes, as well as my confidence in my own abilities. The odds are also increased if it doesn't involve me using my sewing machine. My parents gave me a decent sewing machine a few years ago for Christmas. I've successfully made a few things with it, and I'm definitely grateful to have it. But I'll be the first to admit that I need to practice a lot more. There are probably things I'm doing wrong related to the threading or tension or various feet. Since I don't have one of my sewing mentors nearby, I'm stuck figuring it out on my own. Way to go, me. Should have taken advantage of the opportunity when I lived closer to those people. (Hi Mom, Grandma, Fran and Eilonwy!) My parents also gave me a sewing how to book - should use that more often. Maybe even go through it in order, like a textbook. Oh and Malcolm has varying reactions to the sewing machine. Sometimes he doesn't care. Sometimes he does. Jewelry goes quickly, at least the styles I make lately, though there are some more complicated designs I'd love to try sometime. My jewelry stuff currently lives on the shelf under the coffee table, so I really ought to bust it out and make more things while I'm just hanging out. And then there are all the random crafts I've started or purchased the materials for. Sometimes I get the materials and then don't have the time to do it immediately, so eventually it gets stashed away and I forget about it for awhile. Sometimes I just work on it when I remember, but that's once every several months - this goes to the time factor involved in actually finishing it. Sometimes I'm just not in the mood. This school year, I decided that I wouldn't be taking a dance class in the evening. The friend I was taking the class with last year had a baby two weeks ago, so she wasn't going to be dancing for a few months, and the studio was in her town, which is about 30 minutes away from mine. So, for time and money reasons, I chose to implement a craft night at home during one of the nights Blake is gone for class (he's still working on his Masters). I haven't been able to do it every week, but I have had some success in working on or finishing projects. Knowing I wanted to blog about crafting tonight and if I didn't do something I wouldn't have anything to talk about, I decided to work on a project I started two years ago. The pieces were in two different places (some in the embroidery box, some on a shelf on a bookcase in my living room) and I thought I still had some embroidery to finish. Apparently I finished the embroidery back in . . . um . . . whenever, and the next step was pinning all the pieces together so I could sew them. So I did. Then I realized a few pieces might be set up wrong side out, so I unpinned, flipped some things, and repinned. 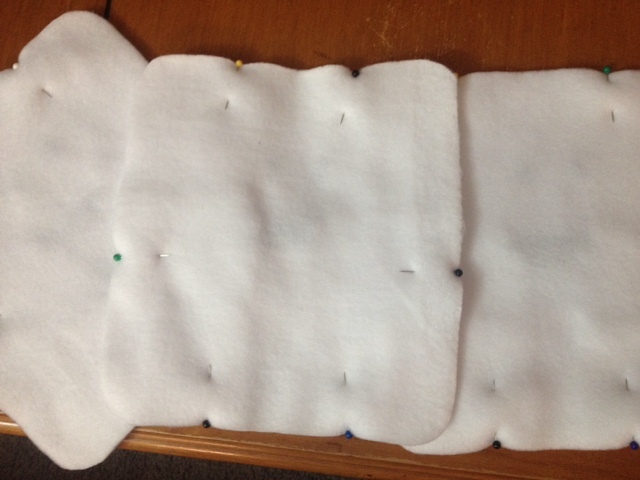 The next step will be sewing. I'm going to go make some snickerdoodles instead. Oh, I know exactly what you mean about follow-through. I'm the worst lately. I blame the depression from being unemployed... My craft store job keeps me going, though, and I love being able to relate to and interact with creative people every time I work! One of my favorite things to tell people when I end up teaching a jewelry class is that you can always start over. You can always undo and start again. One of my favorite recent memories of a jewelry class is of an adult student (who came in with her adult daughter; they were great!) who couldn't figure out what she'd done wrong, so she quietly took the scissors and cut the leather cord she was working with into little pieces. I said, "good for you! If you can't figure it out, start again! And it's ok to get frustrated and annoyed!" Creating is good for the soul, but it's ok to NOT do something if it's just not working out. I can't die. Nobody would know what I had planned to do with all the craft materials and then none of my projects would get finished.